I see the light peeking around the edges of the curtains. I know I’ve slept late. It’s Tuesday. Monday nights mean choir rehearsal, and I don’t get home until 9.30 – well, past my bedtime! It was another night of me not being able to sing, thanks to my myriad colds. I can’t dwell on self-pity for too long: the children have heard Adam putzing in the kitchen and they come climbing into my side of the bed for morning snuggles. Just as we’ve attained fair and equal snuggles for all, Adam comes in to tell us it’s 7.30 and breakfast is on the table. They scramble off the bed and race to the table. I make my way slowly: bathroom, find robe, open up the windows in the bedroom. When I get the table I see bowls of oatmeal in front of the kids and a spinach omelet waiting for me. Adam gets the kids dressed while I take the briefest of showers. Once dressed, I pack lunches and snacks, and off we go. We’re bundled in boots and thick coats. Last night’s downpour surely meant there would be puddles this morning, but no. 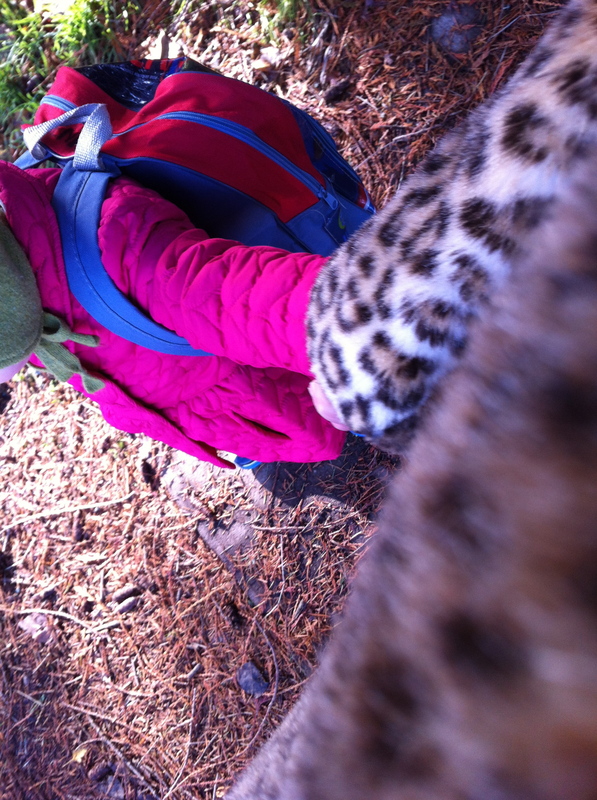 As we walk up the hill to school, my son informs me that Papa was wrong; he didn’t need his boots after all. I drop one kid off at kindergarten, another next door at a preschool. Happy kids are happily learning and playing. I descend home, down the hill, feeling wiped out. I’ve been awake an hour and fifteen minutes. Once home I survey the mess of the kitchen. I feel overwhelmed by all the To-Do’s cluttering up my head. It’s Tuesday, so we have nothing to do tonight, except enjoy one another. It’s Tuesday, which also means it’s Kali puja day. First, though, I need to sit. I make a cup of green tea and sit myself on the horrid burgundy corduroy couch. I enjoy the thin sunlight shining in through the windows. I sip my tea and do the barest of responding to comments, threads, and emails online. I watch a news clip on the Fukushima disaster. I begin berating myself for all the things I’ve left undone: a book review or two, blog posts I keep meaning to write, emails to be written, Christmas presents to sort out, and oh yeah, there’s a book on hold for me at the library. I’m tired of feeling tired and sick of being sick. Self-pity threatens to eat me whole. I remind myself that I’m pregnant, it’s autumn, and I have two small kids that bring every sniffle home. What might fell them for two days will no doubt fell me for five. I’ve been sick every week for 5 weeks straight. But it will pass. I remind myself of that: this will pass. I shut my lap top, drain my tea-cup, and peel myself off the couch. It’s nearly ten. 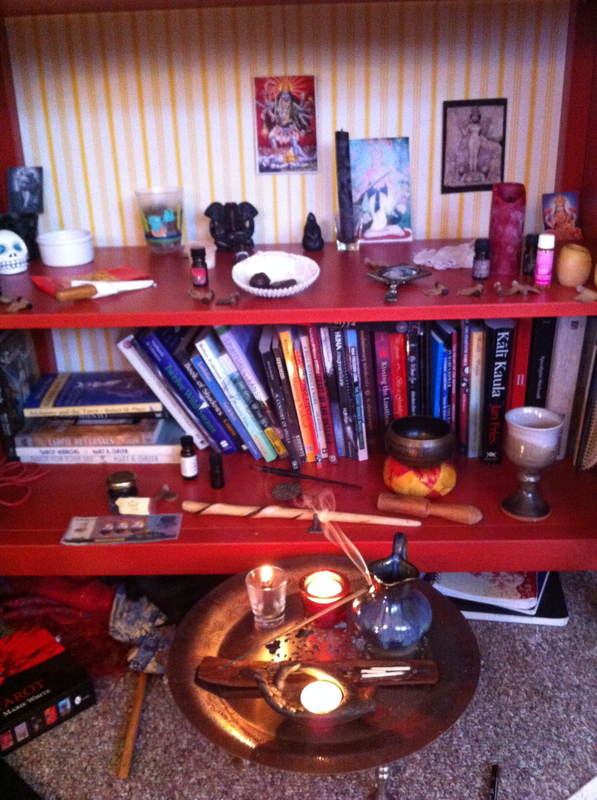 Walking into the kitchen I realize I haven’t bought fresh flowers this week, so I grab a fat medjool date and head to my altar. I lay the date in my offering dish, light my candles and incense, and do the most basic of pujas. Still, puja feels good, like visiting an old friend. While sitting in meditation I think of my 2013 collage up on the fridge. I realize that this last part of the year was ‘set aside’ for rest. My collages are surprisingly prophetic. Sometimes I forget this. I drew the Moon and the Hanged Man for the last few months of this year. While the wheel of the days continue to turn and opportunities continue to knock, I need to realize that this time period for me is one of quiet, rest, and internal contemplation. With that helpful reminder fresh in my head, I bow and make prayers. I pray for my Feri teachers, who are in need of healing right now. I pray for myself, also in need of some immune support. I ask that I might get the rest I need, learn what it is I need to at this time, and gather the strength I need for whatever is to come after this season passes. It’s now 10.30. One hour until I pick up my daughter from preschool. I decide to throw in a load of laundry, then drive out to my friendly local farm and get eggs. I return in time to get lunch heating in the oven before walking up to get the girl. Lunch is last night’s shepherd’s pie with a green salad. 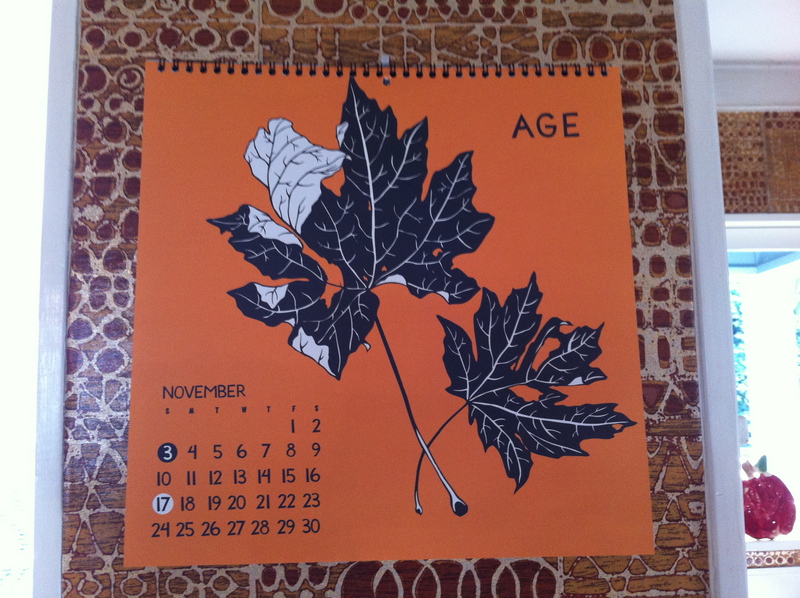 Adam and I talk about how his work is going, the realizations I had in meditation, the news I picked up on the farm; our daughter reminds us at least six times that her birthday is coming up (it’s not until February, but she is obsessed). I tidy up the kitchen. Daughter asks for a bath, so I run the bath, brew a cup of tea and sit to write. Just as I get into the piece she’s through; I dry her off and dress her. She asks to watch Rastamouse while I write. I finish up and move on to general mental housekeeping: answering more emails and making lists of everything: Christmas lists, prepping for the various coming holidays, etc. Cup of tea drained, more cartoons than I care to admit, and one distracted descent into Facebook, I finally get to work on my lists before reading to my daughter and letting her play with marbles. Only half way through my lists, my husband and I decide to do an impromptu drive-by of a potential house (we’re still house hunting) before going to pick up our son from kindergarten at 3pm. The house’s location isn’t quite right. Once home everyone gets snacks. I go back to my lists. The kids get two cartoons before spending the rest of the afternoon drawing, reading and making a mess of the living room. We work on reading homework and I field a meltdown. I’m still trying to organize my lists. I am interrupted every few minutes. I give up and decide to work on it after the kids are in bed. 4.30 rolls around and I realize I need to fold some laundry and start on dinner. After reading the kids two more stories. We do a quick tidy up, which is dismantled minutes later. The youngest comes asking to play with rice. 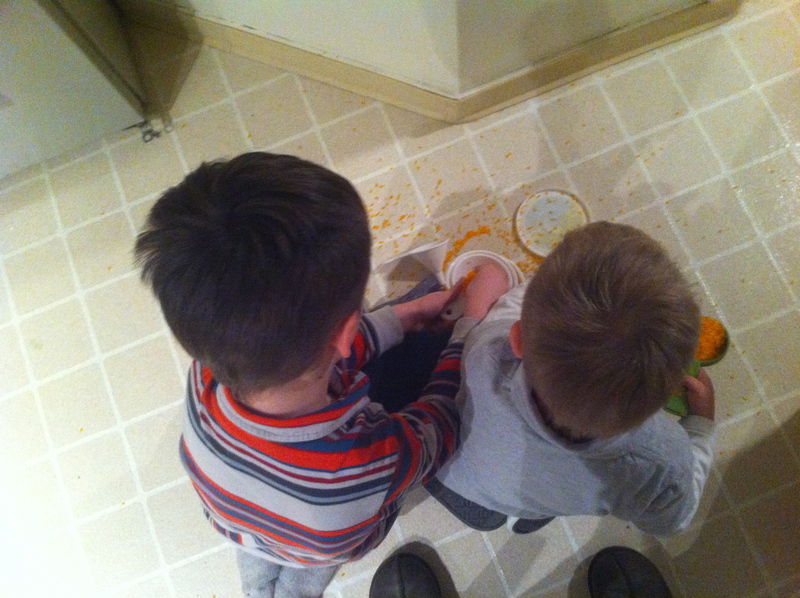 I dye some rice orange and the kids make a fine mess in the kitchen while I cook. The boy asks for a bath, which he runs and then picks up his mess while the bath fills. This is a first. Dinner cooks. Adam watches basketball. I sweep up the rice and start lighting some candles. 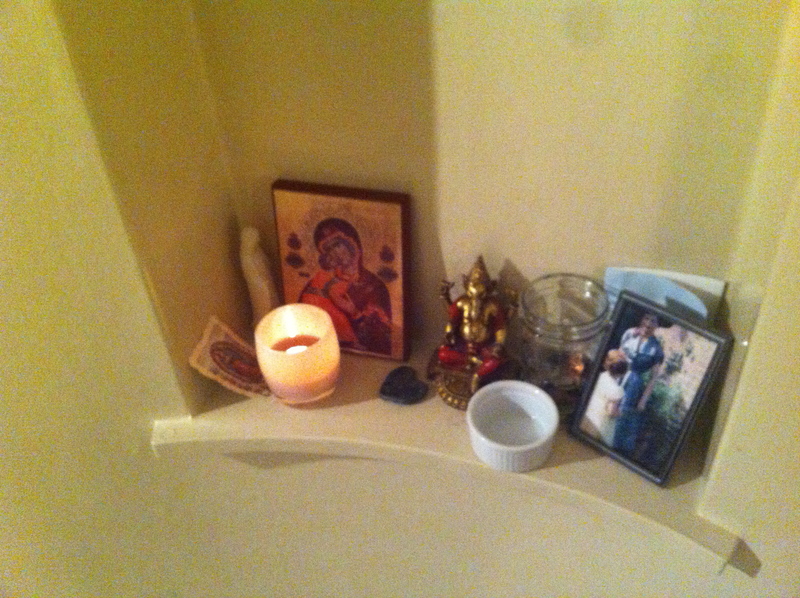 I light the family altar candle, say the Holy Mother prayer and a few others for some family needs. I discuss the meltdown issues with Adam (stress at school). Dinner is lamb and pork meatballs, sweet and sour sauce, roasted cabbage, and chard – all homemade, all super tasty! Everyone asks for seconds. It’s been chaos for the last two hours, but I’m feeling peaceful and sated at the table. After dinner I go to the super awesome neighbors across the street for a quick chat and to pick up some keys. I walk over in my slippers. When I return, the end of the basketball game is on and the kids are reading on the couch. I finally fold the laundry and put it away. I make a cup of throat coat tea for myself and the boy. It’s time for the kids to get ready for bed and, of course, they get squirrelly and riled up. Adam gets them in their pjs and brushes their teeth while I write a little. Pjs, toothbrushing, focus, night-time pees, get out of the laundry basket, time for bed, which story do you want, please focus on you, get in bed. While Adam works on the dishes, a story is read by me, hugs and kisses doled out. Adam goes in to sing them to sleep. It’s not terribly successful tonight. I finally finish making my lists and get organized. I sort out what I want to accomplish tomorrow (add pictures to this post, post it, write up a book review, vacuum the house, don’t forget to buy milk and eggs, and get that package from the post office). I finally open this week’s Economist. And now it’s time for me go to bed. It’s 8.30 and I can’t wait to crawl into bed and do it all again tomorrow. This entry was posted in Uncategorized and tagged family life, health, Kali, paganism, practice, prayer. Bookmark the permalink.